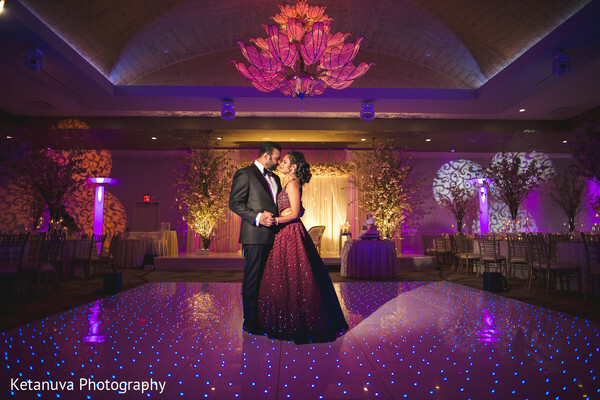 Komal and Raghav flawlessly prepared a magnificent New Jersey Indian wedding reception at the Marigold for their big families and numerous friends! 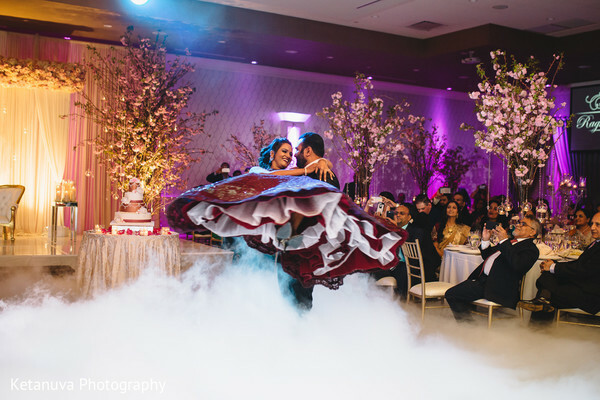 Throwing a party at this scale is always a challenge, so for that particular reason Elegant Affairs Inc. jumped into the scene and designed a charming yet elegant setting with fabulous cherry trees that were lit up with creative uplights from AmpliFIRE Entertainment. 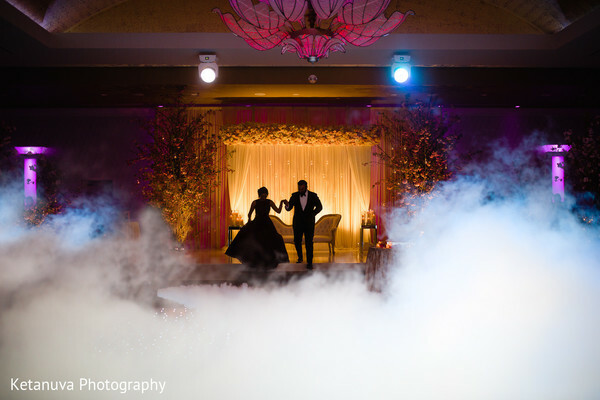 This brilliant team also honored the soulmates during their first dance with a projection of their wedding monogram and a display of shimmering sparks! 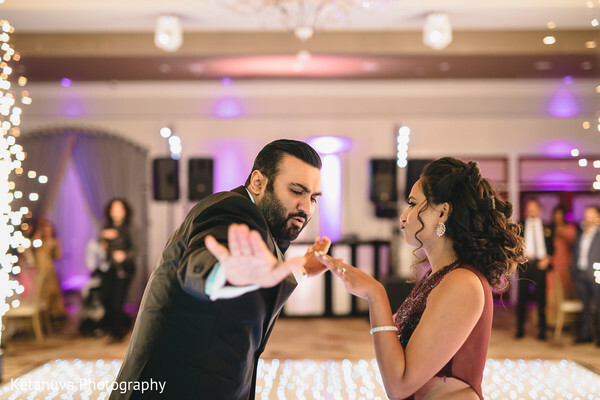 KetaNuva Studios captured the most spirited moments at the dance floor, the emotional speeches that were dedicated to the newlyweds and of course, the exceptional dinner that Chand Palace served to every guest! 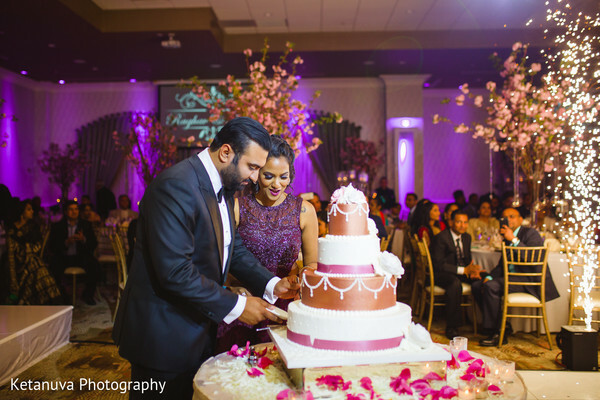 A menu of authentic Indian cuisine delighted every attendee as well as the glorious dual color wedding cake that the new husband and wife charmingly sliced. Do not forget to check the complete awe-inspiring imagery in our full gallery! We crossed paths when we were three, met when we were 13 when I disliked him for being rude when he was actually shy as he had a crush on me. We met again when we were 19 and there was a spark but we lived on opposite sides of the world. When I moved to Boston for my LLM, we reconnected and happened to attend the same International Law Conference in New York. Spent Thanksgiving together, and talking to each other every single day on some pretext. He invited me over for New Years, cooked a lavish dinner for me, and finally admitted that he had a crush on me for all these years. When he hugged me, I finally felt home. And we just knew we were always meant to be. It was my birthday, and he planned to take me to the New York Public Library, I’m an avid reader, and I had never been, so he suggested we go walk around before having dinner in the city. Little did I know that he had something hidden in one of the many isles of the library. I stumbled upon a book with my name on it and was slightly confused. Picking it up I saw the title read ‘My love for Komal,’ by Raghav Patel. The instructions asked me to turn to a specific chapter, and when I reached the last paragraph I saw him drop down on his knees (we were in a library and I had to stop my scream), the last part was his proposal, and the book he wrote was our story, from the age of 3 to when we were 26! 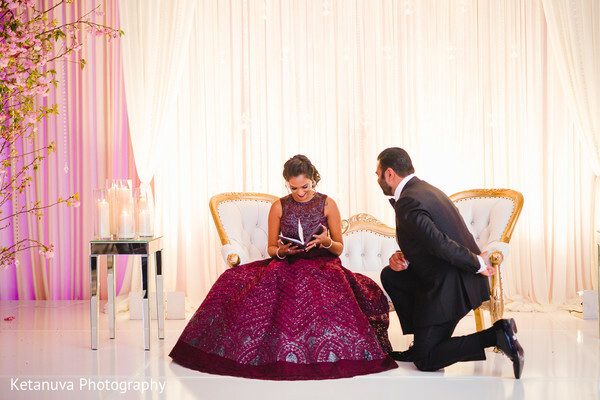 It was a beautiful, thoughtful, and just the best proposal ever! 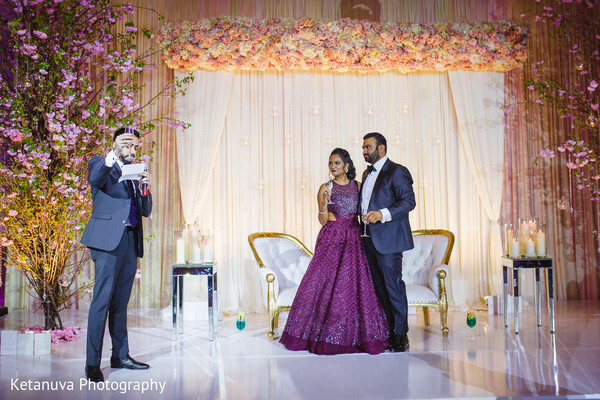 Our wedding events spanned two continents. My sister, who’s an event planner in Hyderabad, India, took care of everything for the Mehendi, Sangeet, and the Wedding Ceremony. 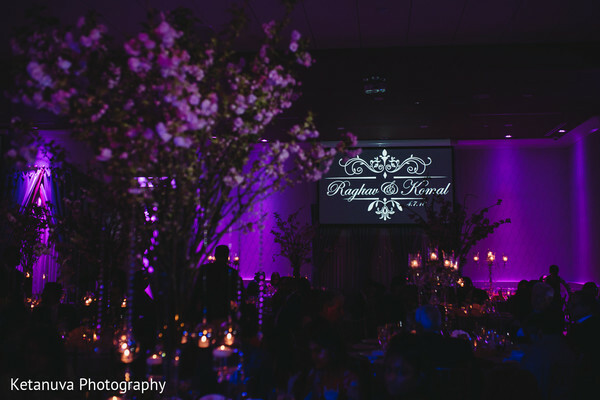 The reception was in NJ in April, and I love Cherry blossoms, so I wanted the decor to be a cherry blossom paradise, the vendors I picked For decor did a fabulous job! I wanted a different look for each event, and a traditional look for the wedding, the quintessential bridal red and gold. For the reception, I went with a deep purple gown by Jade keeping in mind the end of winter and start of spring. To see it all executed to the T was my favorite part, planning a wedding trying to keep everyone happy is not an easy task! Every event had an element of fun, music, and dance to it. Our guests live the two legs of the event, one in India with the big glittery events and the concluding reception here in NJ. Most people say their favorite part was the Sangeet in Hyderabad, that made them feel like rock stars on stage, as they were that day. Mehendi was a combination of Rajasthani folk dancers and singers and a karaoke night. 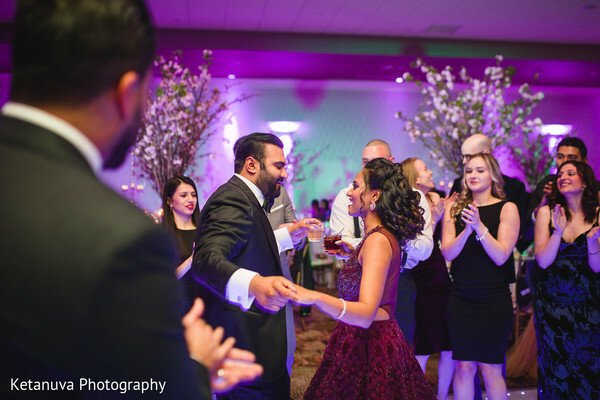 Sangeet was a concert-style event with choreographed performances by friends and families of both sides, followed by a live band performance and a dance party. The wedding was a traditional Rajput wedding, with the baraat going on for more than an hour, fireworks, and general merriment. Reception was a cherry blossom themed event, with touching speeches from the maid of honor, best man, parents. All those thousands of small details you stress about, absolutely no one will notice on the big day. I simply decided to stop worrying about all the things that could go wrong, and thoroughly enjoy those days with my husband, and make it one of the best memory we’ll cherish forever. Visit us tomorrow for more real weddings, vendor suggestions and more! 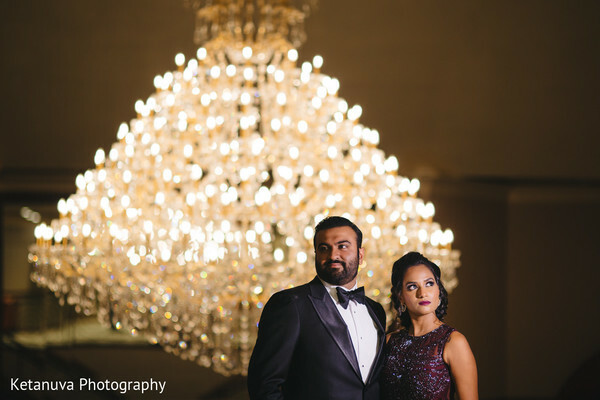 Elegant Affairs Inc., Chand Palace, Kanwal Batool, KetaNuva Studios, Amplifire Entertainment and The Marigold are members of the Platinum Guide. Love what you see? Explore their portfolios.